Entering the floor for this final game, Villanova was the big favourite against Michigan. Before that, both teams had to fight in the semis against Kansas and Loyola. In the first semi, Michigan started well with Wagner and Matthews filling the scoreboard. Yet, during the last six minutes of the first half, Michigan was unexpectedly dominated by a good Loyola team who grinded his way to a 7pts lead at halftime. After halftime, Wagner proved why he was a first round prospect as Loyola could not stop him. He helped his team in a 17-2 run and finished the game with 24pts and above all 15rbds. In the favourites’ semi, let’s say that Villanova make it easy for themselves. Indeed, what a better opportunity than a Final Four to set two three point records. Kansas could not do anything as the Wildcats shot 18 for 40 from three including 4/5 for Paschall (career high 24pts) or 3/5 for Di Vincenzo. They were not the only standouts as Spellman had 15pts 13rbds and 3blks while AP player of the year Brunson had 18pts 6as and only 1to. In the final matchup, the Wolverines led during 12 minutes thanks to 11pts by Wagner in this period. Then, Di Vincenzo decided it was over. The 6-5 sixth man scored 10pts in 3 minutes, helping his team lead 37-28 at the half. The lead kept getting bigger as Villanova started the second half with a 14-5 run, which made it impossible for Michigan to come back. At the end of the game won by Nova 79-62, Di Vincenzo had an impressive 31pts 5rbds 3as 2blks line, a record for a bench player in the title game. Bridges was also good with 19pts on 7/12 shooting for probably his last college game. Villanova has been the best college team the whole year, a tough squad with shooting, athleticism and size inside. 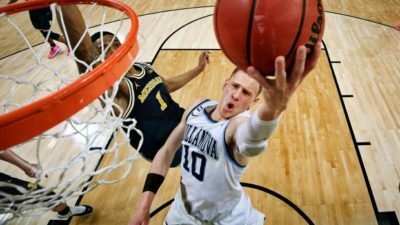 They will lose a few players this summer but count on Jay Wright to find unew underrated jewels. Di Vincenzo’s perf may not be the most spectacular of the long week end. Honestly, how can we not talk about Arike Ogunbowale’s two buzzer beaters to make her Notre Dame team win it all in the Women’s tournament. The 5-8 guard had 27pts against UConn and a more difficult 18pts on 6/21 shooting against Mississipi State, yet, her buzzer beaters allow her to enter the legend of the Final Four.